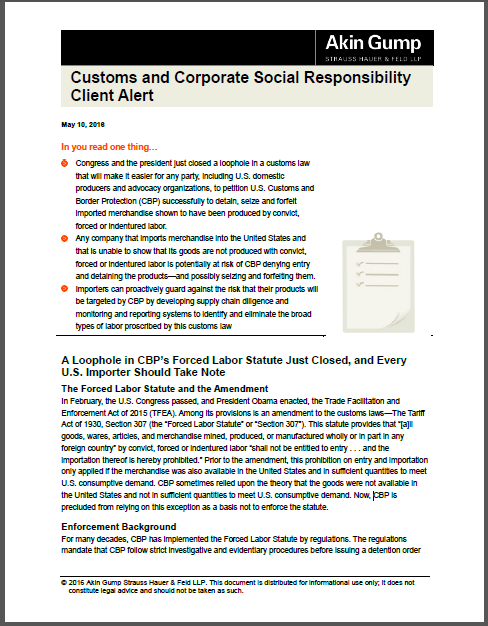 We are glad to distribute this download from our friends at Akin Gump which provides an important update on recent enforcement actions, petitions, and a new CBP task force on the Trade Facilitation and Enforcement Act of 2015 (TFEA) amendment to remove a loophole from the Tariff Act of 1930, Section 307 customs law. A Loophole in CBP’s Forced Labor Statute Just Closed, and Every U.S. Importer Should Take Note The Forced Labor Statute and the Amendment In February, the U.S. Congress passed, and President Obama enacted, the Trade Facilitation and Enforcement Act of 2015 (TFEA). Among its provisions is an amendment to the customs laws—The Tariff Act of 1930, Section 307 (the “Forced Labor Statute” or “Section 307”). This statute provides that “[a]ll goods, wares, articles, and merchandise mined, produced, or manufactured wholly or in part in any foreign country” by convict, forced or indentured labor “shall not be entitled to entry … and the importation thereof is hereby prohibited.” Prior to the amendment, this prohibition on entry and importation only applied if the merchandise was also available in the United States and in sufficient quantities to meet U.S. consumptive demand. CBP sometimes relied upon the theory that the goods were not available in the United States and not in sufficient quantities to meet U.S. consumptive demand. Now, CBP is precluded from relying on this exception as a basis not to enforce the statute. For many decades, CBP has implemented the Forced Labor Statute by regulations. The regulations mandate that CBP follow strict investigative and evidentiary procedures before issuing a detention order 2 (called “an order to withhold release”) or a broader finding, which is published in the Customs Bulletin and the Federal Register. Basically, while anyone can make a referral to CBP for investigation (or it can be self-generated), CBP must have demonstrable evidence that ties the prohibited labor to the production and importation of the concerned merchandise. Even after a detention order or finding, the importer still has the opportunity to prove admissibility and has the right to challenge CBP in court, if appropriate. On the other hand, if the importer is unsuccessful, significant enforcement action can follow—including seizure, forfeiture and other civil/criminal penalties—not to mention crippling reputational harm.